As we are heading into the midst of winter, many of us are already dreaming about where we are going to be jetting off to over the summer holidays for some sun, sea, sand and relaxation. Well, instead of just sitting in the office dreaming about your next vacation, why not instead make it a reality and start planning to book your trip! With so many destinations to choose from now, it can be a hard choice deciding where you are going to go. One of the most popular destination for many years now has been the amazing Greek island of Mykonos because of the amazing range of entertainment, food and activities that it has to offer! 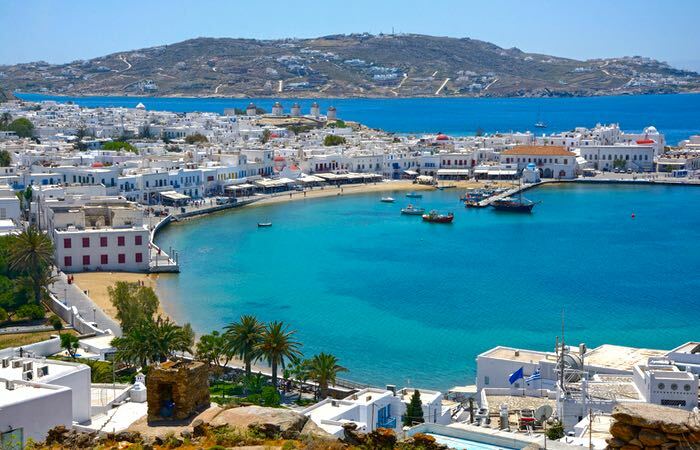 If you want to know more about why we would recommend that you visit the island of Mykonos in summer 2019, make sure you carry on reading. We’ve all been there were we crash diet just before we are due to go off on holiday, purely so we can indulge guilt free once we are there! Well, Mykonos has plenty of food to indulge in and foodies will absolutely love what this island has to offer. If you have never tried Greek food before then you are in for a treat as it is absolutely delicious, and you can expect lots of grilled meats, thick moussakas and light salads. We would recommend looking out for Aegean food such as kopanisti and louzes. The Greek people are also known for their alcohol and you can enjoy a tipple of the famous Ouzo or Tsipouro. Did you know that legend has it that the island of Mykonos was created by the bodies of giants who were slain by the mighty Hercules? This destination is steeped in fascinating history that is sure to delight any history buffs out there who like to familiarise themselves with a country’s past. The island is filled with beautiful landmarks which is also due to its being part Greek, Roman, Venetian and Turkish dominions over the years. We would recommend visiting Mikri Venetia, also known as Little Italy, or the iconic 16th century windmills that it is so famous for. If you love nothing better on holiday than relaxing next to crystal blue waters on a golden sandy beach, then Mykonos is definitely the destination for you. The beach that is at the top of everyone’s list to visit in Mykonos is Kalafatis. This is quite a small beach but it is absolutely perfect for sun bathing on the south coast. Other amazing beaches that you will want to visit include Korfos if you love water sports, Platis Gialos if you are looking for a beach that is more family friendly, and finally, Agrari is amazing if you are simply looking to enjoy some peaceful swimming in the ocean. One reason why so many people love to visit Mykonos is so they can stay in the amazing accommodation here, including a beautiful Mykonos villa by BlueVillas. The villas here are based all around the island, so you can find the perfect destination for you and they also each accommodate a number of different guests depending on how large your party is, so no matter whether you have just 4 guests looking for a villa, or 104, they have the perfect villa for you. Look forward to a private pool, scenic views and a level of luxury you will never have experienced before. When you think of the island of Mykonos, one of the first things that come to mind is the photographs of the famous churches and monasteries that reside here. One of the most famous churches here that you will have to visit is the Church of Paraportiani. This construction is interesting as it actually contains five smaller churches and features the inclusion of many different styles such as vernacular and Byzantine. Other sites that you will want to visit include the Monastery of Paleokastro and Ano Mera’s Cloister. Finally, the last reason why you will want to visit the island of Mykonos is to visit the amazing Armenistis Lighthouse. This location is perfect for photo opportunities and you can watch the boats arriving and departing along its shoreline. It is not a place to be missed and will mesmerise all those who visit. Mykonos is one of the most exciting, vibrant and awe-inspiring destinations in the world and is the perfect place to put at the top of your bucket list to visit next. Make sure you visit here in summer 2019 and enjoy everything that this island has to offer.